Today we have a guest post from Hans from The Rooftop Guide – it features 30 amazing rooftops for an amazing New Year’s Eve party. 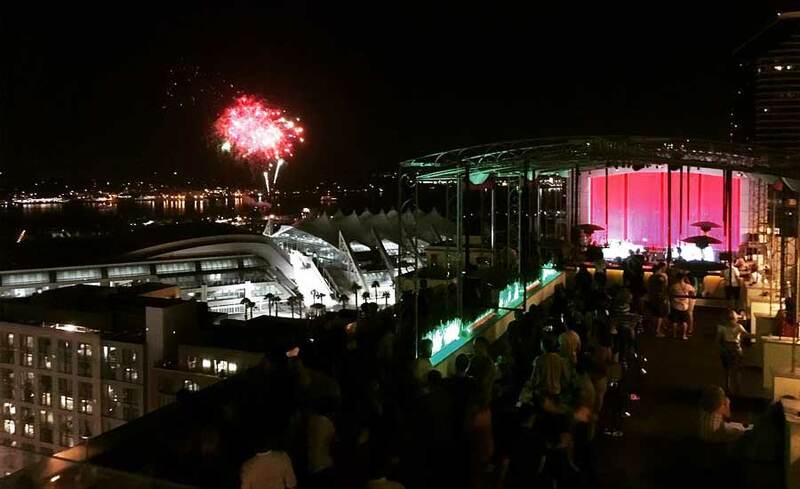 A New Year’s party at a rooftop is probably the best place to enjoy both fun and sky-high vibes, while also getting the best spot to watch all the fireworks. If you would like to celebrate New Year’s Eve at a rooftop and want to enjoy the fireworks with the best view, this is the list for you. All the way from Budapest to Sydney. Here’s the best rooftop bars for a grand New Year’s 2018/2019. SkyLounge Amsterdam is a place among the rooftop bars in Amsterdam where both tourists and locals meet up to drink cocktails and enjoy the stunning panoramic views. A great rooftop bar perched on top of Double Tree by Hilton. Evening and night time the rooftop bar transform into a nightclub with DJs playing until 03.00. An impressive wine list is complemented with a luxurious interior and a pleasant lounge-feeling. With its 1 700 square meters, the Rooftop Sunset Bar is the largest rooftop bar in Bali. Located at the Double-Six Luxury Hotel in Seminyak, it really lives up to its name, as the views you get over the Indian Ocean, especially around sunset, is out of this world. Best enjoyed from one of the luxurious floating lounge-pods at the edge of the terrace. A perfect rooftop in Bali to see all the fireworks and the ocean. 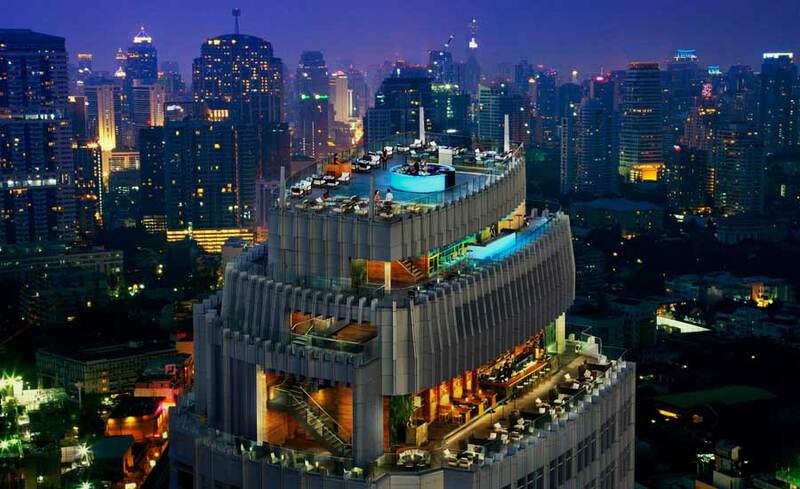 A roof that extends over three floors and with a stunning 360-degree views across Bangkok. Here you can sit down in the comfy lounge furniture while peeking at the New Year’s fireworks and enjoy delicious cocktails and tasty food. Located a little outside the city center, but the eventual taxi trip here is worth every penny. Perhaps the best rooftop bar in Barcelona. Here you get a magnificent view over the city all the way to the Mediterranean Sea and the beach. The Majestic is a 5-star hotel located in the center of Barcelona. 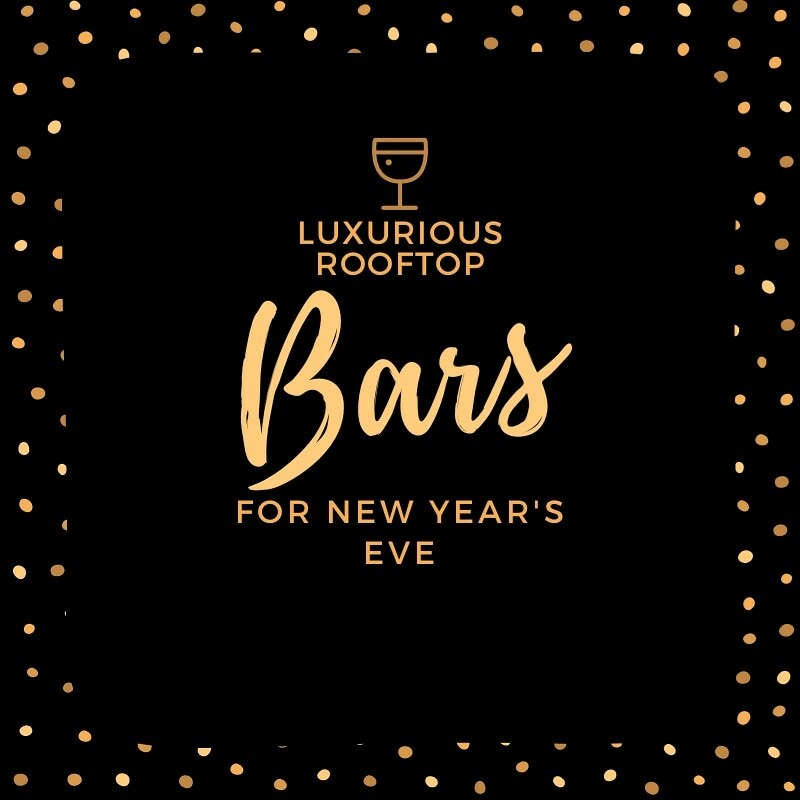 The prices are quite high, but the view, the drinks and the comfortable atmosphere makes a perfect rooftop bar to celebrate New Year’s Eve at. Dinner is not available out at the terrace. 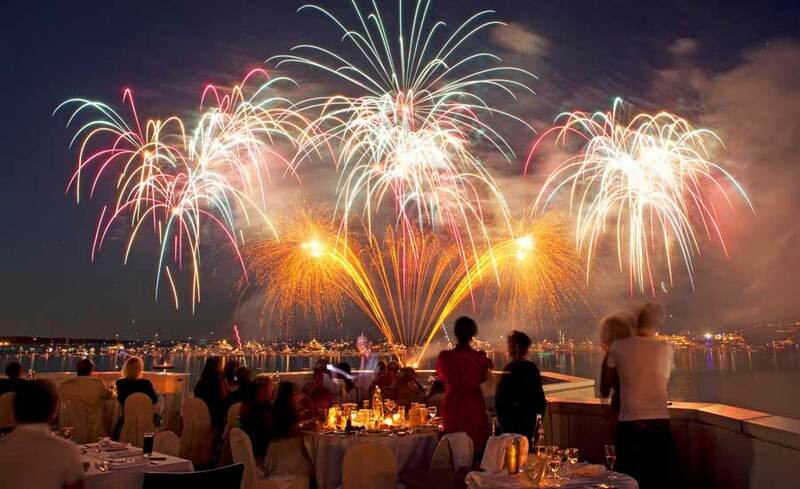 But this is a perfect venue for drinks and to see the fireworks. 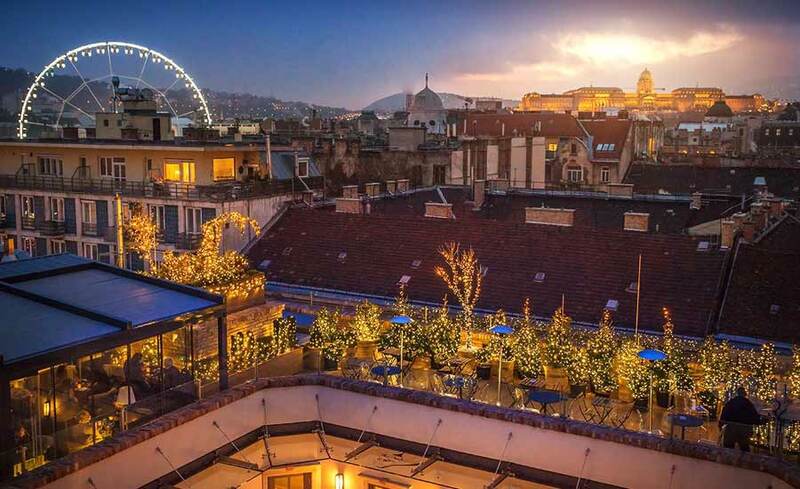 Budapest’s best rooftop bar located on the luxurious and modern hotel Aria Hotel – which usually ranks as one of the best hotels in Hungary. 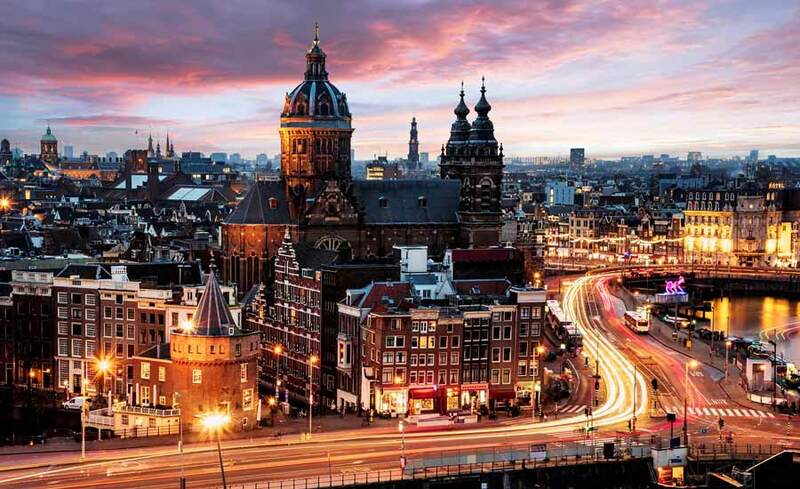 The location is central and the view extends 360 degrees around the city. Many comfortable lounge furniture to settle down in. But dress warmly, Budapest is cold in the winter and this is one of few rooftop bars in Budapest that is open all year round. A better location is hard to find in Cannes when speaking of a New Year’s party. Overlooking both the beach, the sea and city. Here you have a front row seat in terms of everything. Large terrace with room for many guests. In the bar you can order both good drinks and a little simpler food from a bar menu. The hotel is located right on the beach boardwalk. LondonHouse Rooftop is a fantastic tri-level rooftop bar, located right by the Michigan Avenue bridge and Chicago River. The tri-level setting consists of an indoor lounge, called LH on 21, the main and largest terrace called LH on 22 and the private dining space called Cupola. The terrace at LH on 22 have a superb view among the city’s skyscrapers and out towards Lake Michigan and the Chicago River. Probably the best in Chicago. A magnificent open-air terrace located 155 meters above ground. From up here you get a magical 360-degree view of the entire city of Dubai amid the skyscrapers in the downtown area. Grand views over all the famous monuments along with sunset views over the Jumeirah coastline. Quite large and very stylish terrace with a lot of lounge furniture’s, along with a smaller indoor lounge with a cool bar. Plaza Hotel Lucchesi Florence has a very luxurious rooftop terrace, showing off with a lovely rooftop pool and an American rooftop bar called Empireo, along with an absolutely stunning view of Florence skyline and the surrounding enviroment. From here you can catch the Doumo, Fiorentina’s home stadium Artemio Franchi, the Arno River and see all the way to the Tuscany Hills. The world’s highest rooftop bar located 480 meters up and with an outstanding view of the entire city of Hong Kong. 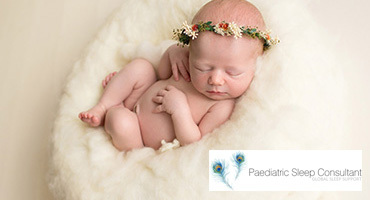 The bar and restaurant is super luxurious and have a great party atmosphere. A much better place for a fantastic rooftop New Year’s party is probably impossible to find in the whole world. 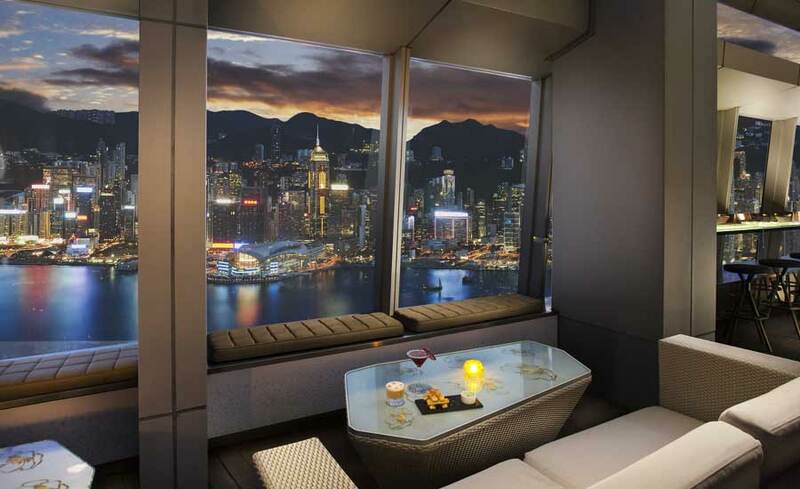 Located in the Kowloon area of Hong Kong, about 10 minutes by taxi from Hong Kong Island, with views across the skyline. Wooloomooloo Steakhouse Hong Kong have perhaps the best location of all rooftop restaurants in Hong Kong, located right in the heart of Wan Chai. There are actually two Wooloomooloos in HK, but it is the one at the 31st floor of the Hennessy building that offers an absolutely magical view of Wan Chai, Happy Valley and Victoria Harbour. The Wooloomooloo restaurant is a steakhouse with lots of fantastic meat dishes. The restaurant with the best terrace and view at Troika SkyDining is called Fuego. Fuego is a South American restaurant aiming to offer new tastes and a fun and festive atmosphere. The food is mainly focused on South American tapas and the cocktails are well made classics with a new twist. At the colourful terrace there is a festive and sophisticated vibe and the views you get over the skyline and the Petronas Towers are simply breathtaking. 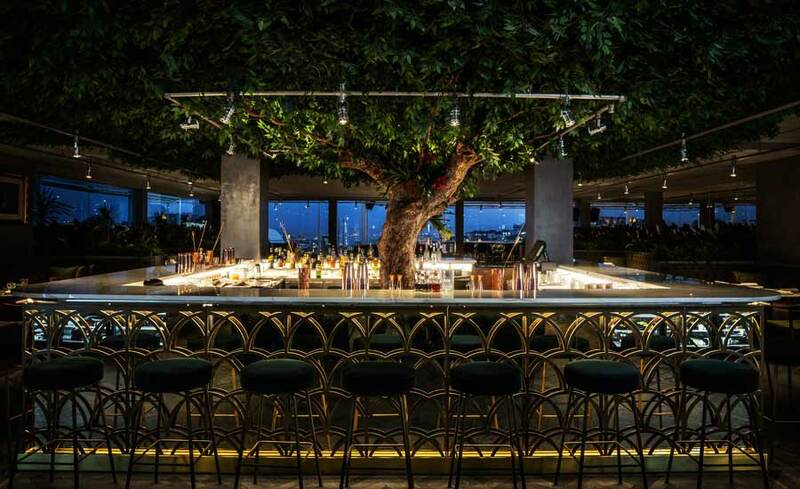 Located on top of the modern and chic Hotel Tivoli, right in the center of Lisbon, you find Sky Bar Lisbon and the rooftop restaurant called SEEN. The 9th floor location and open-air feel of the terrace means there is a really panoramic view of the city on display, from downtown all the way out to the river. SEEN has a unique concept guaranteed to excite Lisbon nights and attract the hippest and the coolest. Bokan is an easy-going and sophisticated hideaway, that transports you far from the city buzz of the busy streets below. 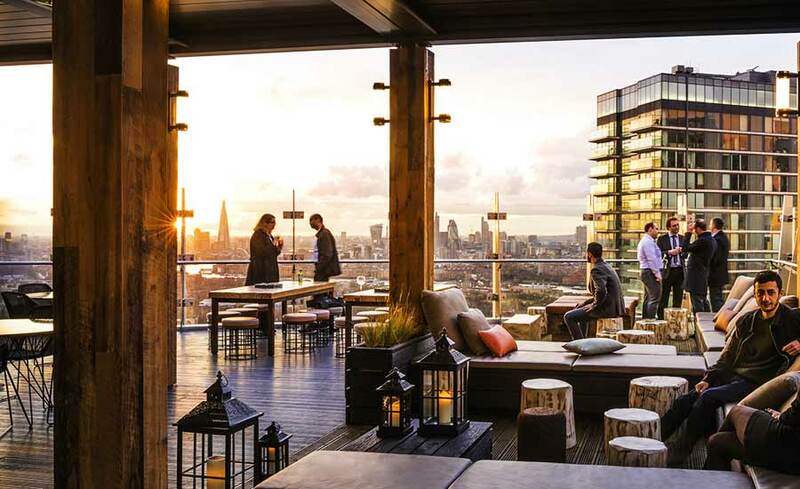 The bar and roof terrace at Bokan 39 feature a specialist gin bar, rooftop daybeds, Sunday jazz sessions, all with spectacular and striking views of London. Explore a wide range of cocktails made by a talented team of London’s top mixologists, who will create many innovative cocktails influenced by London’s Docklands. One of the most luxurious rooftop bars in London. The location is central and from the roof terrace you’ll get fantastic panoramic skyline views over London and all it’s famous buildings and monuments. This is one of the best and most famous rooftop bars in London, so expect a lot of trendy people on the terrace. 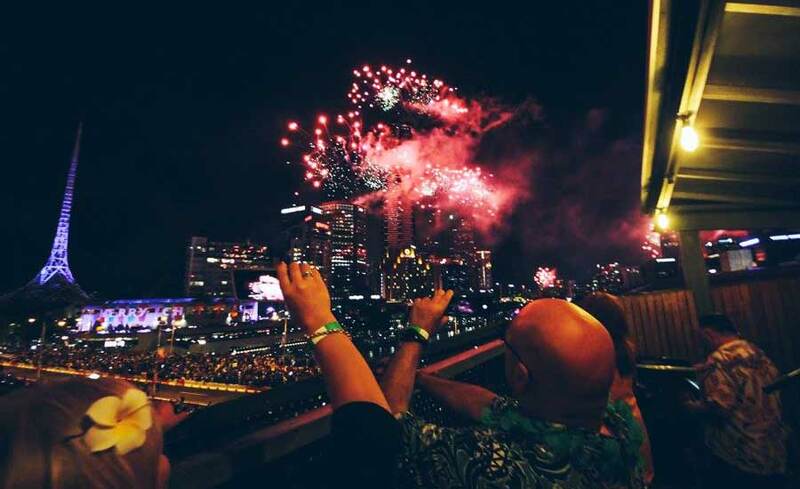 Radio Rooftop is a perfect rooftop bar for a New Year’s party or just to watch the fireworks. Spire 73 is perched on the 73rd floor on top of the famous hotel called InterContinental Los Angeles Downtown. This is one of the highest rooftop bars in the world, and also the highest in the Western Hemisphere. The roof terrace offers spectacular views over the entire city. All the way from Hollywood to the beaches. Fire pits creates a cozy feeling among the different seats, everything from comfy lounge sofas, to classic bar stools and chairs by the edge. Except the fancy view, Spire 73 is famous for its bar. Delicious signature cocktails and a wide selection of different Whiskey’s are available. The terrace is perched on top of the luxurious hotel NH Collection Gran Via, with breathtaking city views in all directions. The space is divided in three different areas where you can sit. All with their own unique view. The biggest area has a big bar counter and a small DJ booth. The view from here is quite magical. Sweeping city views over Madrid, as far as the eyes could see, and in all directions depending on what area you sit in. Futuristic, stylish and industrial in setting, the Transit Rooftop Bar might only be two levels up but still offers magical views of the Melbourne skyline, the botanical gardens and the River Yarra below. Located on top of the Transport Hotel, which is actually not a hotel but a bar / restaurant complex with Transport Public Bar on the ground floor, Taxi Kitchen one floor above and then Transit Rooftop Bar up top. 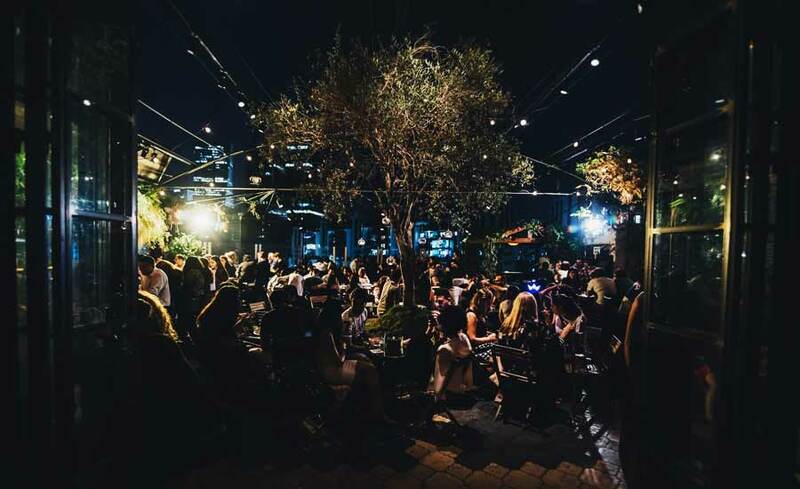 Situated right by Federation Square and the railway station, Transit has both indoor lounge and open-air terrace with quite a lot of seating. Probably the best rooftop bar in the world during the colder days. 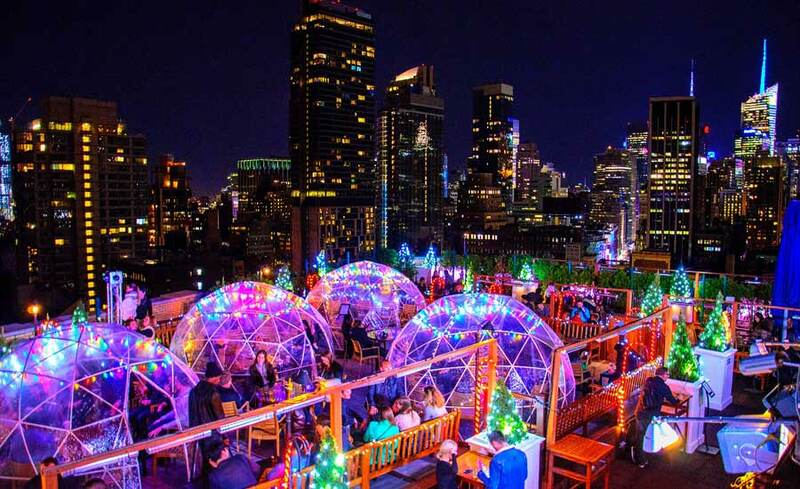 The rooftop at 230 Fifth is equipped with some super cool rooftop igloos where you can sit on the terrace overlooking the NYC skyline while having the luxury of being cosy and heated. The views over Manhattan and the Empire State Building as awesome from up here. A perfect New York rooftop bar for New Year’s. Monarch Rooftop Bar is located on the 18th floor and is perched on the building’s penthouse. From the terrace you get a stunning view over midtown Manhattan, and most of all, fantastic vistas of the famous sky scraper Empire State Building. Up here you find a rooftop bar and an indoor lounge, both very modern and stylish with a Scandinavian-chic feel, light and airy with lots of comfy lounge sofas and bar stools. St. Cloud Rooftop is located at the Knickerbocker Hotel, just off Times Square in New York. From the terrace you get a lovely view of all the sky scrapers. 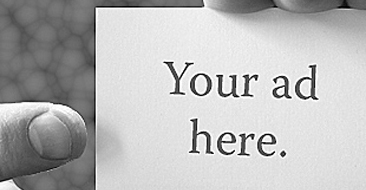 In fact, you are right among them. 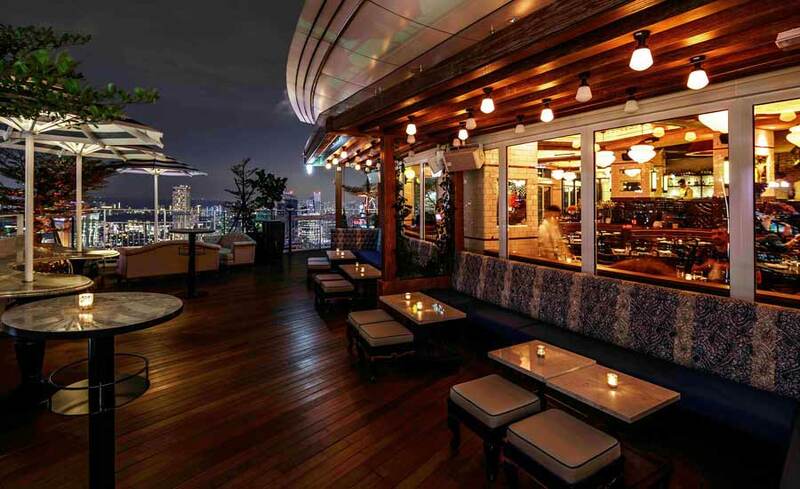 An exclusive rooftop bar that is luxurious and modern furnished. There are seatings both indoors and outdoors, which makes St. Cloud NYC a perfect place both in summer and winter. Fasano Rooftop Pool Lounge is ranked as one of the best rooftop bars in the world. Here you get a magical view of the Ipanema beach, Rio’s skyline and the sea. At the rooftop bar you can order refreshing drinks, juices and tasty food with a fantastic service. Everything here oozes quality. The interior is very luxurious with a large swimming pool in the middle of the terrace. Hotel Raphael Rome has a very cozy and genuine roof terrace, that also holds a restaurant called Mater Terrae. Here you can expect very good service, great food along with cooling drinks and Prosecco. And a magnificent 360-degree view over Rome. The whole hotel has an organic orientation, and this shows at the terrace and restaurant also. The food is vegetarian, biological and biodynamic and most of the wines from the extensive wine list are organic. So, a visit at this rooftop bar is not only good for the taste buds, but also for the soul and the environment. 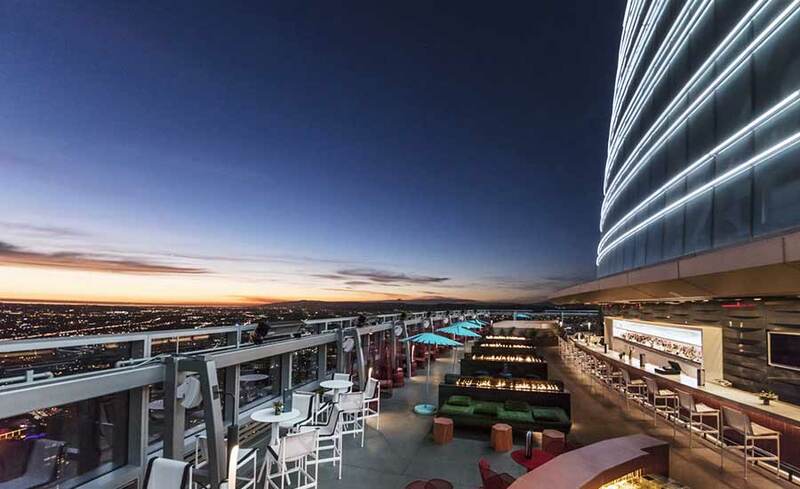 Altitude Sky Lounge is a stunning rooftop bar in San Diego, overlooking the city skyline. Here you can also see into the famous arena where the baseball team San Diego Padres play their home games. On match days people jostle along the railing to get a glimpse of the match. When there is no match, then Altitude Sky Lounge is the perfect place for after work or just some relaxed hangout. Good drinks, great service and a modern decor. CÈ LA VI is a large and impressive place, and for sure one of the best rooftop bars in Singapore, and even in the world. Split in two, here you find a restaurant and sky bar on one side (views towards ocean/Gardens by the Bay) and sky deck and club lounge on the other (views towards skyline/Marina Bay). A luxurious setting throughout, with both indoor and outdoor seating, where the terrace comes with large red umbrellas, dining tables, comfy lounge sofas and bar stools right by the edge. Lavo Singapore is an Italian-American restaurant with a luxurious feeling. The restaurant also has a fantastic roof terrace with panoramic views over the Singapore skyline and Marina Bay. The rooftop and restaurant are perched on the 57th floor of the famous Marina Bay Sands. The loungy and luxurious feeling makes this one of the best rooftops to celebrate New Year’s at. Stockholm Under Stjärnorna (Stockholm Below the Stars), located on top of hotel At Six, offers a spacious and colorful 1200 square meters terrace with three bars, a radio station booth, rooftop gym, plenty of different hang-out places and panoramic 360-views over the rooftops of Stockholm and Lake Mälaren’s inlet. From the rooftop bar(s) you can order signature cocktails and endless classics, two different alcoholic slushies (Frozé and Friezling), beers and wine along with tasty international street food. Café del Mar Sydney is a luxurious rooftop bar that brings a slice of Ibiza right to Darling Harbor and the heart of the city. Both regarding the restaurant and rooftop terrace. Up here you get a beautiful view of the Sydney skyline and the waters of Darling Harbor. The very stylish indoor restaurant with floor-to-ceiling windows opens up to the large balcony terrace. With modern and comfy lounge furniture, blue and white shades and a cool outdoor bar, the beach club vibe is obvious. This hotels gem is located on the 3rd and 4th floor, and here you’ll find a cocktail bar called Elephant Bar & Rooftop. Up at the small but very stylish rooftop terrace you get fantastic views over the eastern suburbs of Sydney and all the way to the skyline. The decor feels somewhat like an English garden, with old style chairs, round tables and a green hedge framing the terrace, which is also equipped with heaters and cozy hanging lanterns. Up on the 10th floor of an old parking garage in the heart of Tel Aviv you find (a bit surprising) this trendy and beautiful rooftop bar. Living up to its tagline “Drinks & Happy Food”, SuraMare rooftop bar also comes with a fantastic view of the Tel Aviv skyline and surroundings. Urban chic lounge and terrace, similar to something you would expect to find in New York City.